RahmanNet - Reza Rahman: Reza Rahman's Java Blog: Microsoft Comes to the Philadelphia JUG! Microsoft Comes to the Philadelphia JUG! 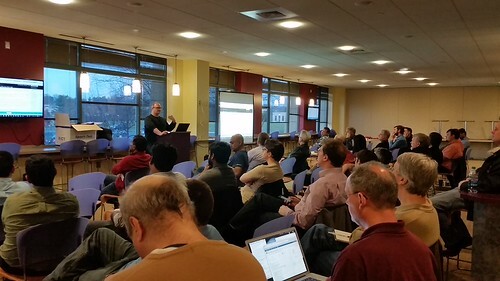 On March 22 Microsoft's Brian Benz spoke at the Philadelphia JUG. This was the first meeting after the leadership switch at the JUG and all considering the meeting went pretty well. Brian spoke to us about using Java on Microsoft's Azure cloud computing platform. Martin Snyder - current president of the Philadelphia JUG - could not attend due to personal reasons and sent his regrets. We did however have good representation from the board. I served as site coordinator this time and Paul Barton as well as Paul Snyder also attended. We introduced ourselves to the attendees before Brian's talk. Brian's talk was very well received including good Q + A. The slides for his talk are embedded below (click here is you can't see the slides). Below are some cool photos from the meeting (the photos are also linked here). It's worth noting how remarkable it is for Microsoft to be coming to speak at a Java user group. It was unthinkable a mere few years ago but Microsoft is making genuine attempts to court Java developers to Azure. More than anything else this speaks to the continued strength of Java. Whatever one thinks about Microsoft the reality is that the company has always made strong efforts to engage developers. Some sections of Oracle could learn a thing or two about how to engage developers. Indeed I think Microsoft could make a big difference by contributing directly to the JCP. I asked Brian about this during Q + A - he chuckled and suggested this was not the first time he was asked the question. Microsoft's interest in Java is such that my former colleague Yoshio Terada - a long-time Japanese Java EE evangelist with Sun/Oracle - is now working in the Azure team with Brian to engage the Java community. 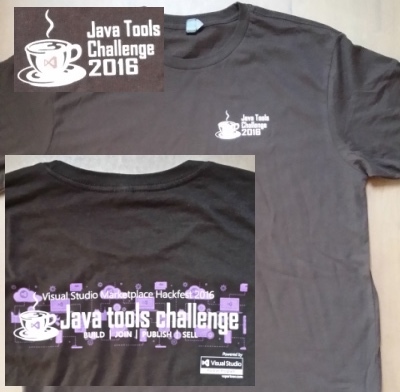 Besides coming to speak at the JUG, Microsoft very generously also sponsored dinner for attendees and brought some very cool T-shirts highlighting their support of the Java community (the shirts are pictured below). Brian left behind plenty of T-shirts for us to give away in subsequent meetings. Make sure to pick one up if you come to the JUG meetings the next few months. Our next monthly meeting is going to be on the currently white hot Apache Spark. The month after that we will have two separate meetings - my former colleague Heather VanCura talk about the JCP and we will have Java powered NAO robots (demoed at JavaOne)! I will finish off the season with a talk myself before the JUG goes on brief Summer break. I hope to see you at a Philadelphia JUG meeting soon!